The HSE Children and Family Services has published the Annual Report 2011 and Annual Report 2012 and a series of reports carried out by the National Review Panel (NRP) for Serious Incidents and Child Deaths – showing 38 children in HSE care, or known to the HSE, died in 2011 and 2012. 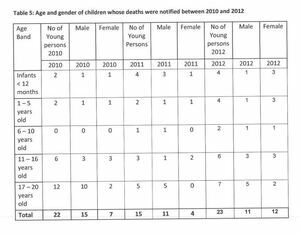 There were 60 deaths in total between 2010 and 2012. 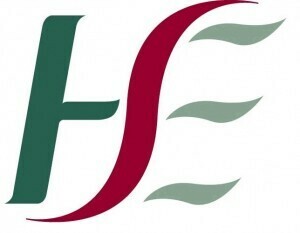 The reports have found there were 15 deaths and one serious incident concerning children in HSE care, or known to the HSE, in 2011 and 23 deaths and one serious incident in 2012. 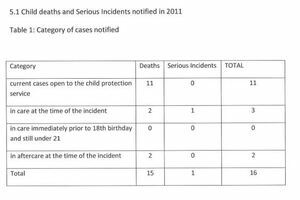 The report states the HSE were not notified of four deaths which occurred in 2011 until 2012, but that these deaths are included in the 2011 figures. 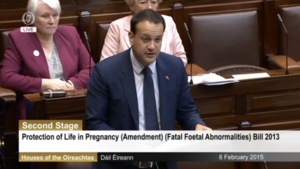 Eight died by natural causes. Two died by an overdose. One died from a road traffic accident. One died in an ‘other accident’. Two died from road traffic accidents. 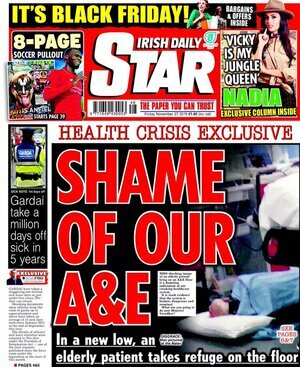 Four died in ‘other accidents’. Seven died by natural causes. 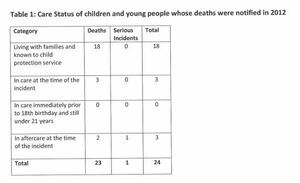 The following table details the total number of deaths of children in HSE care, or children know to the HSE between 2010 and 2012. 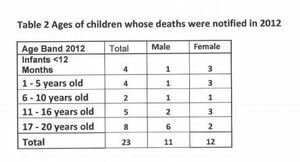 Posted in Misc and tagged 2011 and 2012, Child Deaths, HSE at 4:42 pm on November 14, 2013 by Broadsheet.